The Epicurean Hotel, a boutique hotel located in Tampa, FL is a hospitality experience to indulge the senses with no design detail spared. 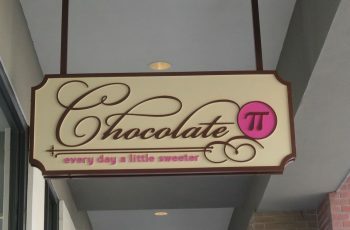 Creative collaborated with Beck Group and Check Development on the unique implementation of signage to the greater “foodie” theme of the hotel space. 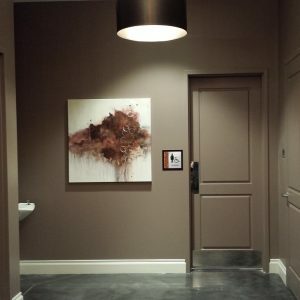 The Epicurean Hotel is situated at 1207 South Howard Avenue in historic Hyde Park, a picturesque neighborhood with cobblestone streets and range of boutiques. The Epicurean Hotel offers an immersive experience for the senses – from dining, to relaxing at the spa, to culinary classes and EDGE rooftop bar. Other than being in the social address of the city, the attention to design detail is the signature of this boutique hotel. With 137 luxury rooms, AAA Four Diamond Rating and lined with retail space, this hotel provides accommodations with uncompromised taste. Creative Sign Designs was selected to partner with Bern’s Steak House and Mainsail Lodging & Development to develop the signage program for this iconic space in conjunction with contractor Beck Group/Check Development. 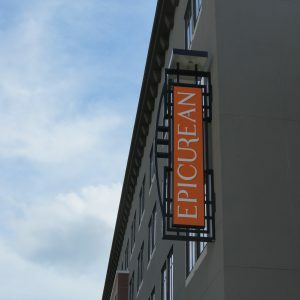 With Creative’s niche being design-build signage, working with the Epicurean Hotel was a natural fit. 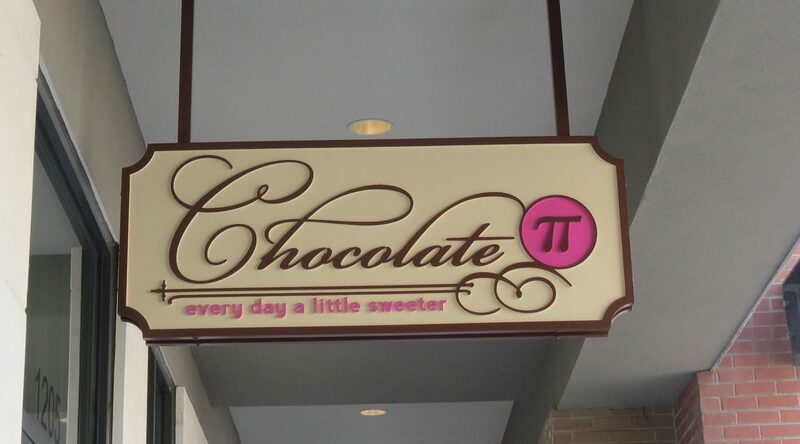 The goal was to bring the client’s vision to life by seamlessly integrating the signage to match the sophisticated and culinary-themed boutique space. The sign program included custom, illuminated guest-room signs; wayfinding and directional signs; unique elevator lettering; exterior, hanging tenant signs; and an architectural-design, exterior blade sign. 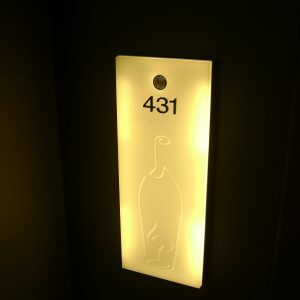 Sparing no detail, each illuminated guest-room sign is designed to feature a routed design of either a cutlery set or wine bottle. 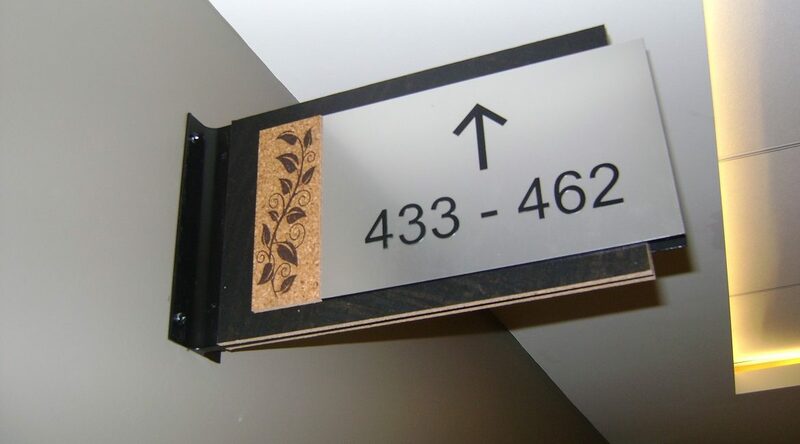 The wayfinding and directional signage is crafted from custom cork material and continues the design style in rich colors. 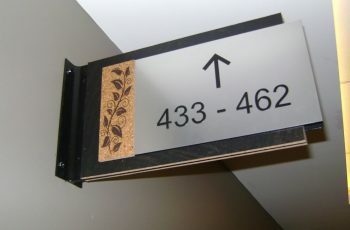 The lettering for each elevator mimics a measuring system, like that on cookware cups, with lettering from ground to ceiling and each floor indicated by oversized number markings. 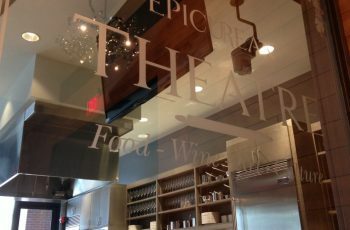 Each unique, hanging tenant sign identifies the Epicurean Hotel’s retail offerings that line the street front: the signature restaurant Élevage, in-house patisserie Chocolate Pi, presentation kitchen Epicurean Theatre and wine shop Bern’s Fine Wines & Spirits. Finally, the exterior blade sign is intricately welded and vibrant, clearly noticeable from down the street. 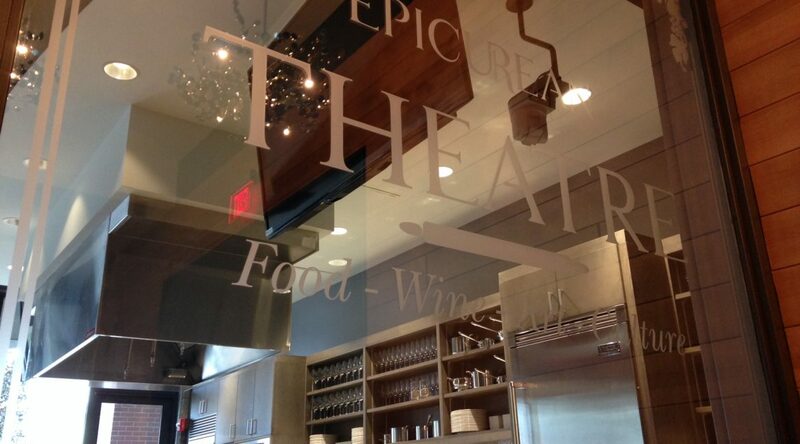 A hospitality space as carefully designed and crafted as the Epicurean Hotel demands equally thought-out signage. 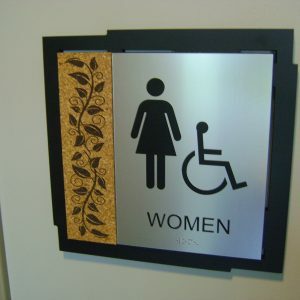 Design-build signage is the differentiator between installing necessary indications in a building and installing a signage program that accentuates the cohesive vision for a space. It provides a sense of thoroughness in planning and capitalizes on the opportunity to transform common markers into tailored elements. The partnership between Creative Sign Designs and the Epicurean Hotel is an exhibition of the opportunities in design when working within the boutique hospitality industry. 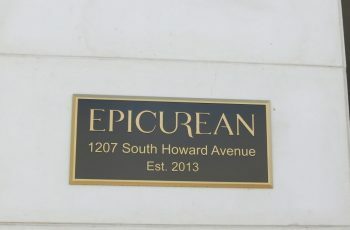 The Epicurean Hotel opened in December of 2013 and has since become a mainstay in the SoHo district abundant in dining and entertainment and only minutes away from the waterfront Bayshore Boulevard. 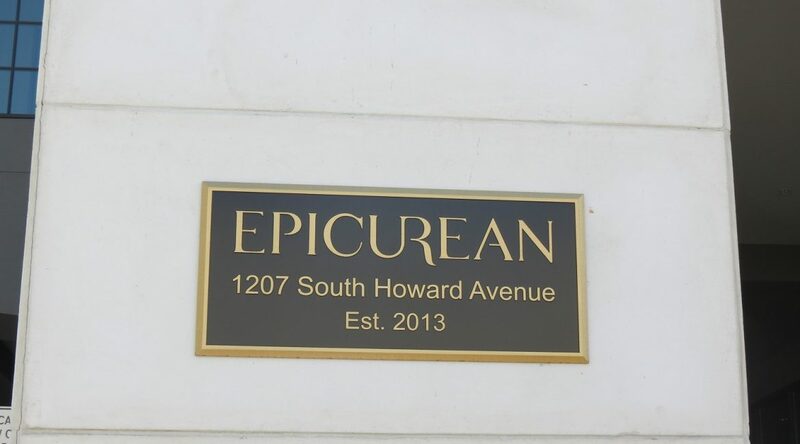 The Epicurean Hotel is the first newly constructed property in the United States to join the prestigious Autograph Collection® of Marriott International, Inc.